Exactly. These ethics could hardly be acted upon over the lifetimes of the disciples, let alone later Christians. It explains why Paul said the “time was short” when answering a question on marriage. If you think the world is ending, marriage seems to be a trivial matter. This problem severely damaged my faith as a Christian. It never recovered. If Christians actually read the text for what it says, many more would see their faith damaged. many just ignore it. Or persuade themselves it does not exist. Bad faith. This just shows yet again what an utterly impractical religion Christianity really is. So, wearing a black sheet over your entire body and a black cloth bag over your head, with layers of underclothes underneath in the sweltering uncompromising heat of the desert is practical? Is drinking camel’s urine practical too? LOL, classic moronic comment by Coco the dancing monkey! Dance around the issue and deflect to Islam!! Dance monkey, dance! Why don’t you deal with the impractical advice your false apostle Paul gave to his followers? He was clearly mistaken is believing that the “time was short”. What else could he have meant, imbecile? Did you find anything about menstruation? Your religion is so impractical, you cannot even answer this simple question. You embarrassed yourself so many times already and are now avoiding discussing it. Poor, poor dancing monkey! meaningless waffle. 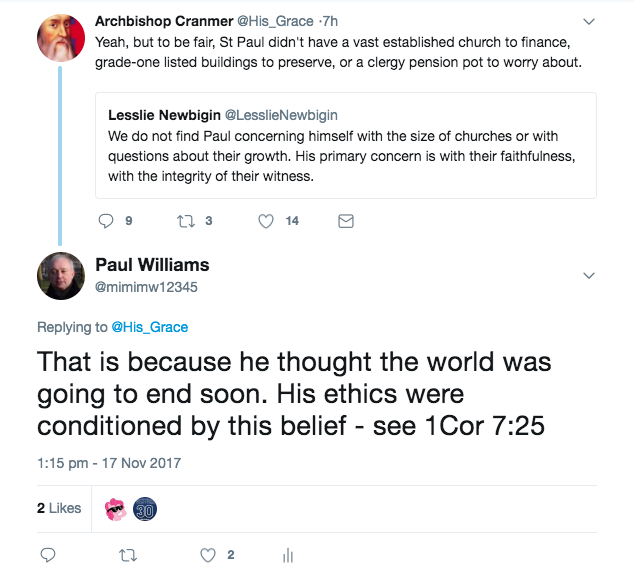 Try and articulate a more insightful & analytic response to a fact about Paul’s ethics that is commonly recognised by biblical scholars. My response to a waffling tweet is perfectly appropriate. 1 cor 7 does show an erroneous belief in an imminent end. Actually that should read…”does NOT show an erroneous belief in an imminent end”. yes – you were. Then you had a mental relapse. Why don;t you support you assertion with an argument? This appeal to authority works with muslims who are commanded to obey muslim authorities, but not with everyone else. Verse 29 he says the time before the End is short. Time is running out and there is little time left. This (of course mistaken) view conditions his ethical advice to the Corinthians about marriage etc. Posting a wall of text without a accompanying argument doesn’t help you. I still see no evidence that your assertion is true. So you won’t support you assertions with a logical argument? I did. Do pay attention. Verse 29 he says the time before the End is short. Time is running out and there is little time left. This (mistaken) view conditions his ethical advice to the Corinthians about marriage etc. Not convincing in the least. Where does he say the words “the time before the End is short”? LOL, Coco’s denial is absolutely hilarious! The time is short, Coco. That’s what Paul the false apostle said. The present world is passing away. Repent! The end is near. Like I said, if people read the text for what it says, faith in Christianity would topple. But some people prefer to lie to themselves and others and live in their own fantasy world. Pathetic zombies! On the part of the “scholars”. Not Paul. Does the Qur’an that the final hour could come at any time? “They ask you, [O Muhammad], about the Hour: when is its arrival? Paul was talking about the hour that it comes in his life NOT that it “could” be in his own life.